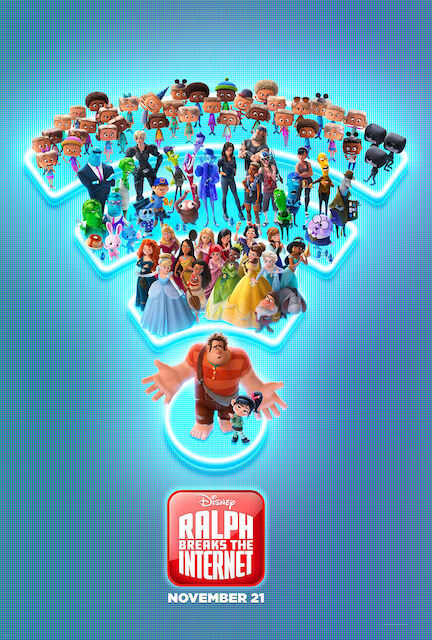 Walt Disney Animation returns to the digital world of Wreck-It Ralph with the new sequel, Ralph Breaks the Internet. Ralph (Reilly) and Vanellope (Silverman) are back for a new adventure that kids and families are going to love. It’s been about six years since the events of the first film. Ralph and Vanellope are still best beds living their live in the game world situated within Mr. Litwak’s arcade. However, life for Vanellope is growing rather stale. She’s looking for something new and exciting. Ralph attempts to spice things up for her Sugar Rush experience by building a new makeshift course within her game, Sugar Rush. Unfortunately, that only causes the game to unintentionally break down in the real world, and the steering wheel for Sugar Rush gets severely damaged. The damage to the steering wheel for an old game means Mr. Litwak needs a part replacement or the arcade game is going to get trashed. So, Ralph and Vanellope decide to go to the internet to find the eBay listing for the replacement part to save her game. However, upon discovering the internet, Vanellope may have found her true calling, and Ralph fears he will lose his best friend in the process. Ralph Breaks the Internet is a satisfying and emotional sequel that offers a deeper psychological look of Ralph and Vanellope’s relationship. Ralph wants to protect Vanellope from what he finds are bad influences, such as Shank (Gal Gadot) and the racers of an online Grand Theft Auto-esque title, Slaughter Race. Vanellope is ready to leave the nest and discover more about the outside world, but Ralph is playing the over-protective parent. Unfortunately, he’s a little too over-protective, which has grave implications for his treasured friendship and the safety of the entire internet. Directors Rich Moore and Phil Johnston did a tremendous job in establishing the digital arcade world for Wreck-It Ralph, and they’ve provided a robust expansion for Ralph Breaks the Internet. Much like their work on the amazing Zootopia, they’ve clearly put a lot of thought into the world and making the Internet a living, breathing world that’s rife with activity, complete with some familiar, real-life branding, which for this story, makes sense. In Ralph Breaks the Internet algorithms, spam programs and search programs are given life as colorful characters, such as Yesss (Henson), who is the algorithm who basically runs all of YouTube. Alan Tudyk, who voiced King Candy in the original film, is back once again and unrecognizable as KnowsMore, who basically runs an Ask Jeeves type of search engine. Moore, Johnston and their co-writers have meticulously built out this world bit-by-bit, so the Internet feels like a natural place that makes sense. The film does a great job of telling the story visually, and there are tons of great visual Easter eggs. The bowels of Internet world show some amusing sight gags that kids won’t understand, but adults who were on the Internet in its infancy will understand. The Slaughter Race world is a clear standout, and of course, the scene where Vanellope visits a Disney website and interacts with some familiar faces, providing some of Ralph Breaks the Internet’s funniest and most standout moments. There are a some instances in Ralph Breaks the Internet where some story elements could’ve used either some greater exploration. There’s a bit of lip service paid to nasty internet comments and toxicity when Ralph gets on the goofy YouTube video train in order to collect hits to get some ad revenue. This idea is introduced as a major turning point, but then it’s surreptitiously dropped. Additionally, Ralph has a major screwup here that hurts far worse and cuts far-deeper than his good-natured error in the first film. This mistake seemed to lack the necessary introspection for just how badly Ralph messed up. Ralph is still the main character at the end of the day. While he is a bit of a lovable oaf, this error was really close to crossing the line and really could’ve used a bit more servicing within the plot. Another character who could’ve used more screen time is Alfred Molina’s Double Dan. Double Dan is this fleshy slug-like spam program who lives in the Dark Net. Unfortunately, his screen time is marginal. Double Dan could’ve made for an interesting central villain for the story, which this story generally eschews. Otherwise, Ralph Breaks the Internet is an entertaining ride from start to finish, featuring topnotch CG animation by Walt Disney Animation, great characters and a strong, emotional story that’s not afraid to get a little dark at times. Rich Moore and Phil Johnston use this world and characters to tell a great, if a little familiar story, about parents learning to let go so their kids can find themselves and live their own lines. This is a great story that truly tests the bond of Ralph and Vanellope’s friendship. Ralph Breaks the Internet is a great animated movie that's not quite on par with the original in terms of writing and story, but it far surpasses Wreck-It Ralph in terms of visuals, world-building and humor. The story is filled with a nice amount of character drama, which is not surprising considering the high quality output of Walt Disney Animation in recent years. This is a great movie for parents to watch with their children and families. No one will want to leave during the closing credits. Anyone who leaves during the credits will regret it.